In Game of Thrones on TV, is Arya's sword Needle portrayed faithfully to the books? And would it be classified as a shortsword? .. Jon had pulled off the rags he’d wrapped it in. He held it out to her. Arya’s eyes went wide. Dark eyes, like his. "A sword," she said in a small, hushed breath. The scabbard was soft grey leather, supple as skin. Jon drew out the blade slowly, so she could see the deep blue sheen of the steel. "This is no toy," he told her. "Be careful you don’t cut yourself. The edges are sharp enough to shave with." Arya lifted it out almost tenderly and drew the slender blade from its sheath. Needle. So yes, I think the series portrayed it close to the description in the book. George R. R. Martin made the following comment which makes it clear that the show version is not faithful to the book one as he seems to only have used cruciform sword designs. As such it appears that GRRM agrees that this is the version of the sword that is true to the books. Jon Snow: Close the door. This is no toy. Be careful you don't cut yourself. Arya Stark: It's so skinny. Jon Snow: So are you. I had the blacksmith make it for you special. It won't hack a man's head off, but it can poke him full of holes if you're quick enough. Game of Thrones, Season 1 Episode 2, "The Kingsroad"
So as far as this company goes the shows portrayal of needle is different to the books. Valrian Steel appear to have gained exclusive rights in late 2006 for A Song of Ice and Fire replicas. I couldn't find the exact release date of the book needle but there is a review on it from Jul 21 2009, 12:00 PM. This is before the first season started filming in July 2010 and aired in April 2011. As such it is very possible it was created before the props for the show meaning it is the true version of the sword. Note that GRRM sent Maisie Williams the book replica to practice with before filming the first season. As such this furthers the evidence that GRRM's version of the sword is different than the shows version. As for whether it is a short sword or not, I would say the book's version is but the show's version is not. There isn't that much info on the sword. We simply know that it is small and slender so that Arya can hold and use it. The sword that is shown on the show is small and slender, Arya can use it to fight Braavosi style, so you could say that it is faithful to the sword's description in the books. I don't think it classifies as a shortsword. The sword is being mentioned as being small, but we don't know the exact size. Noone mentions it as a shortsword. The books mention it repeatedly as a thin Bravos blade. Later on, when Sam is confronted by a Bravo, the sword is again described as thin. SO I imagine it is the equivalent of a rapier from 1500 here. It seems to be about what the book described. The film Needle is not as heavy or broad as what people tend to call a shortsword. It's also not nearly as long as a rapier. I'd classify it as a smallsword, which is like a short rapier, though it (including the hilt shown) is like a gunpowder-era fencing design. There's a replica for sale which has the same sort of blade but an older hilt style. One of few things we know for certain is that Needle in the books has sharp edges. That makes it clear that Needle is not a smallsword - they are exclusively thrusting weapons with no blade at all. Another thing we know is that it is not a rapier since they are quite long (around the length of longswords) and relatively heavy, generally as one-handed (a.k.a arming) swords or a bit heavier (because of the point of balance the rapier feels lighter). It may be shortsword. However, according my knowledge "shortsword" as a classification term is an invention of modern fantasy literature, sometimes it means arming sword, sometimes anything smaller (Roman gladius, Scandinavian sverg, Egyptian kopesh, etc). 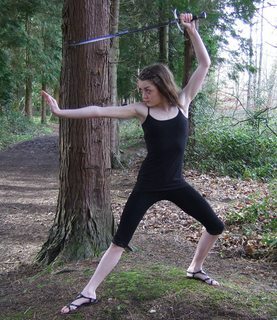 I'd say Needle is not a standard mass produced sword but a sort of "toy" (but certainly highly usable and deadly if the need arises)m designed for a little girl to learn some basics of swordplay before getting a more useful blade. Not the answer you're looking for? Browse other questions tagged game-of-thrones a-song-of-ice-and-fire weapon .